This November 11, the 100th anniversary of the end of World War I will be remembered around the world and the men and women who served will be honored. America did not enter the war until April 1917, three years after it had begun. But by November 1918 more than four million American families had sent their sons and daughters to serve in uniform. By the time of the Armistice, 116,516 U.S. soldiers had died from combat and disease and another 200,000 were wounded. Photo of Second Lieutenant Roberts in his Army Reserve uniform taken in the 1920s in Albert Smith’s Manchester studio. 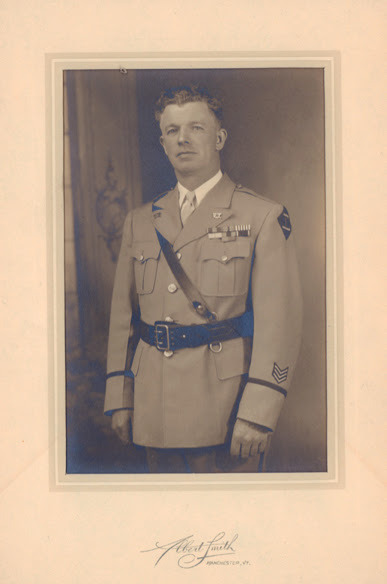 The Manchester Historical Society was recently honored to receive 12 letters written by Alfred Edwin Roberts during his tour of duty in France to his family in Manchester. This timely gift came from his daughter, Janice Roberts Cable, and included uniforms, medals, photographs, and war artifacts. Roberts, who had been born in England in 1899, came to Manchester in 1910 after his father was employed in the marble business. He attended the East Manchester school, a one-room school located on the corner of what is now named East Manchester Road and Route 11/30. In the summer he and his brother Jim worked as caddies at the Ekwanok Country Club golf course. In June 1916, he left Burr and Burton to enlist in the Vermont National Guard and was assigned to Company A of the First Vermont Infantry. After the U.S. declared war on Germany, President Woodrow Wilson ordered the National Guard into federal service and the First Vermont Infantry became part of the 26th Division, called the Yankee Division because it was formed out of National Guard units from the New England states. His final assignment was to Company B of the 103rd Infantry. Along with thousands of other American soldiers, he sailed for Liverpool, England, in September 1917. One month later, young Alfred was in France. After spending the winter and spring months being trained by seasoned British and French officers, the 103rd, along with other units of the American Expeditionary Forces, were finally thrown into combat in what would be the final months of the war. Alfred was gassed on July 21 in the opening days of the Aisne-Marne Offensive and spent six weeks in Base Hospital No. 28 in Limoges. He was back with his unit in time to take part in the St. Mihiel Offensive in September and the famous Meuse-Argonne Offensive in October and November, considered to be the greatest American battle of World War I. 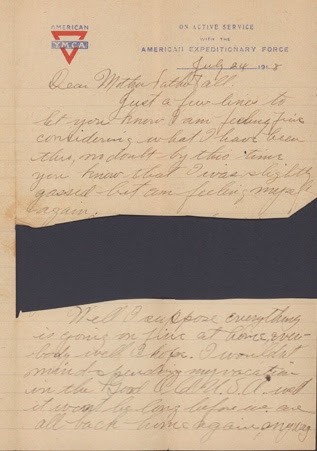 Letter home describing his being gassed clearly was too descriptive for the Army censor. We were just getting ready for another “over the top” when we received word of the armistice, believe me we were the proudest boys in the world to think that we were hammering the Boche when he quit, and we all thanked our lucky stars that we lived to see the end of war. I had a bullet pass thru my pants leg just above my knee just graised the skin, one of the fellows with me had a bullet go thru his helmet, just stunned him for awhile but he kept on going.Alfred had been promoted to sergeant on November 13, 1918. He left France on April 2, 1919, from Brest, landed at Boston, and was discharged on April 28, 1919, at Camp Devens, Mass. In 1929 he was commissioned an Infantry Second Lieutenant in the inactive reserves and served for five years. After the war he returned to Manchester and worked in construction. He married Marjorie Bourn on December 12, 1921, and raised a family. He also took up his place in the Manchester Band. Alfred has the distinction of being one of an exceptional group of Americans who served in both world wars. In 1942 he enlisted in the U.S. Navy, and was assigned to the Naval Construction Battalion, also known as the “Sea-Bees” (CB’s). Alfred suffered the rest of his life from the repercussions of gas poisoning as well as bouts of malaria and dysentery picked up in southeast Asia during World War II. He died in 1951 and is buried in Factory Point Cemetery near his mother, father, and two siblings.